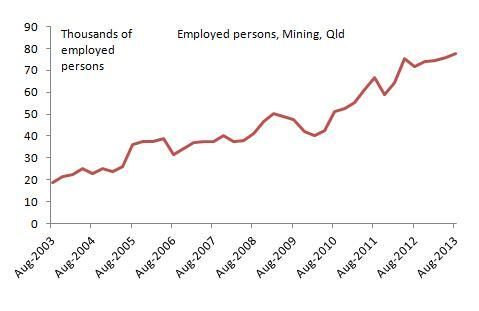 Employment in the Queensland mining sector still appears to be growing, although at a slower rate, according to the detailed quarterly data released today (see chart below). This suggests the concerns raised earlier in the year by some commentators over the possibility of large-scale job losses were misplaced. This entry was posted in Labour market, Mining and tagged abs, employment, jobs, labourforce, mining, qld, queensland, resourcessector. Bookmark the permalink. Quite an unusual statistical outcome there Gene – it doesn’t appear to reflect any observable on-the-ground reality from this vantage point. Certainly, no one I have spoken to in the industry here believes it. My brother-in-law was lucky to keep his job as the mining company sacked the service company that he worked for and employed him directly to save money. “A slew of mining job cuts in Queensland coalfields this week has seen the tally exceed 1000. So Queensland mining employment has managed to grow strongly while shedding over 7000 jobs in the past 6 months at the same time? Perhaps there has been a change in how these statistics are measured? You can see see the large fall that occurred in the wake of the GFC – I saw the actual jobs go with my own eyes. Yet now I am seeing something similar but the statistics instead are telling a story of solid growth. Perhaps it is skewed by the mega-projects here at Gladstone? They will shortly begin to wind up. One of the companies announced the other day that it’s current construction workforce of over 2000 will fall to an operational workforce of around 200 by next year. This seems consistent with what I have witnessed as a long-term resident of a town at the end of the mining production chain – for every 10 people it takes to build a new mine, railroad, processing plant, shiploading facility etc, it typically only takes 1 to run it once complete. The picture is probably further complicated by the fact that over the past 5 or more years, large numbers of people employed in Queensland mining have not been permanent Queensland residents but rather, from interstate and overseas. The statistics are telling me that with the right credentials, I should still be able to walk into a mining job without any trouble. Everyone in the industry I have spoken to tells me that they are not hiring. Yes, you may be right that the stats could be influenced by the Gladstone mega projects. There is clearly an important regional story to mining employment. Coal mining in CQ is shedding jobs but CSG in Darling Downs-SW appears to be going very well indeed. That would be the wells and the pipework. These are obviously part of the mega projects themselves and need to be generally complete before the LNG plants can begin exporting next year. Perhaps they are ramping up activity to make sure they are complete within the time frame – a fully completed LNG plant cannot export gas until the network of wells and pipes that feed it are themselves completed. Unless something shifts the course of events fairly dramatically, I suspect that next year will likely see the Queensland mining-related workforce shrink significantly. As an afterthought, the LNG construction workforce here at Gladstone solidly exceeds the total number of reported job losses in Queensland mining. Curtis Island truly deserves the title of “mega-project”. As I said, these will shortly begin to wind up and by this time next year the number of people they employ will probably have fallen by around 90%. Very good point. Thanks HH.